The tool most highly praised at Philadelphia was the American felling axe (fig. 52) “made out of a solid piece of cast steel” with the eye “punched out of the solid.” When compared to other forms, the American axe was “more easily worked,” and its shape permitted an easier withdrawal after striking. Augers, essential to “the heavier branches of the building trade … [and] in the workshops of joiners, carpenters, cabinetmakers, turners, carvers, and by amateurs and others,” were considered a “most important exhibit” at the Centennial. 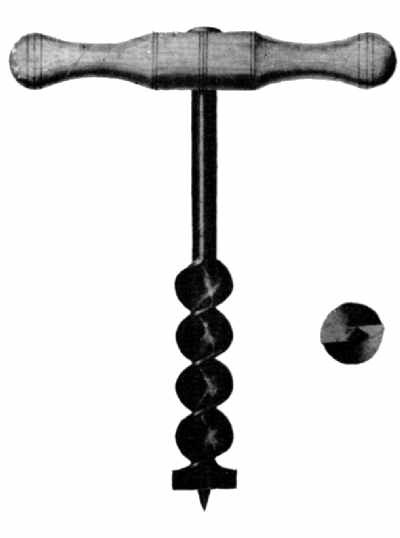 The auger had attained a perfection in “the accuracy of the twist, the various forms of the cutters, the quality of the steel, and fine finish of the twist and polish.” The ancient pod or shell auger had nearly disappeared from use, to be replaced by “the screwed form of the tool” considerably refined by comparison to L’Hommedieu’s prototype, patented in 1809 (fig. 54). 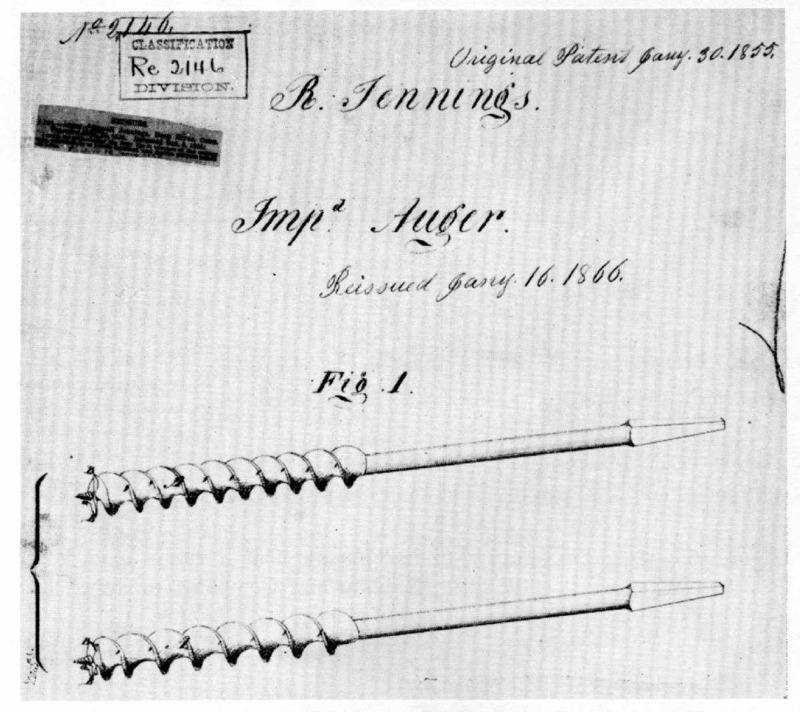 Russell Jennings’ patented auger bits (figs. 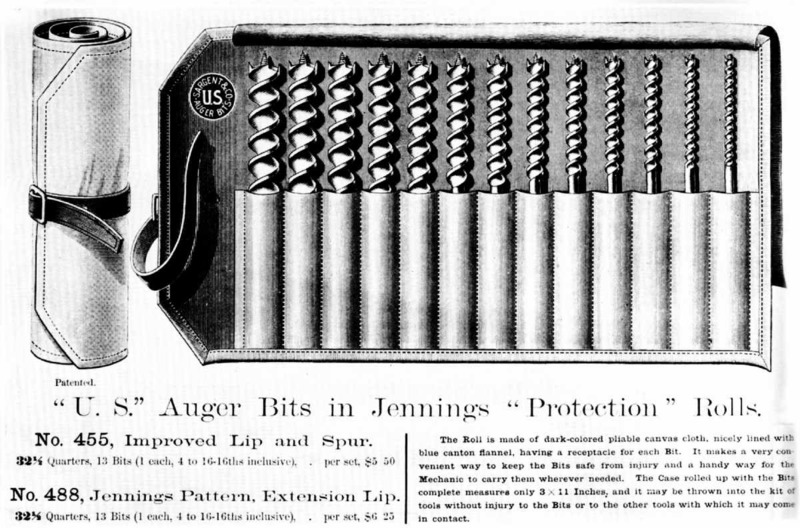 55–56) were cited for their “workmanship and quality,” and, collectively, the Exhibition “fully established the reputation of American augers.” Likewise, makers of braces and bits were commended for the number of excellent examples shown. 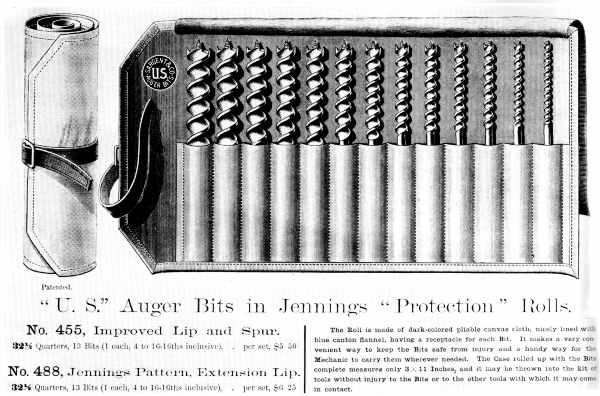 Some were a departure from the familiar design with “an expansive chuck for the bit,” but others were simply elegant examples of the traditional brace, in wood, japanned and heavily reinforced with highly polished brass sidings. An example exhibited by E. Mills and Company, of Philadelphia, received a certification from the judges as being “of the best quality and finish” (fig. 57). The Mills brace, together with other award-winning tools of the company—drawknives, screwdrivers, and spokeshaves—is preserved in the collections of the Smithsonian Institution (accession 319326). Today as a group they confirm “the remarkably fine quality of … both iron and steel” that characterized the manufacture of American edge tools in the second half of the 19th century. 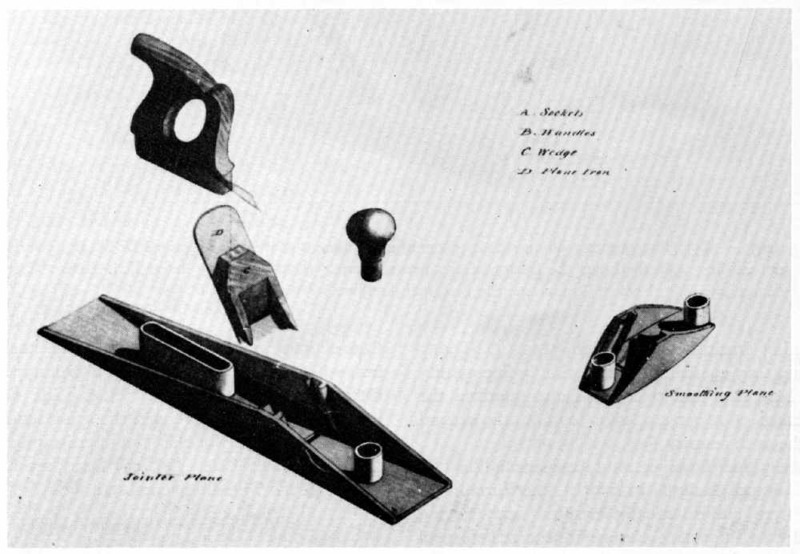 First to simplify the manufacturing of planes; second to render them more durable; third to retain a uniform mouth; fourth to obviate their clogging; and fifth the retention of the essential part of the plane when the stock is worn out. This invention relates to an improvement in that class of planes which are commonly termed “bench-planes,” comprising the foreplane, smoothing plane, jack plane, jointer, &c.
The invention consists in a novel and improved mode of adjusting the plane-iron to regulate the depth of the cut of the same, in connection with an adjustable cap, all being constructed and arranged in such a manner that the plane-iron may be “set” with the greatest facility and firmly retained in position by the adjustment simply of the cap to the plane-iron, after the latter is set, and the cap also rendered capable of being adjusted to compensate for the wear of the “sole” or face of the plane stock. 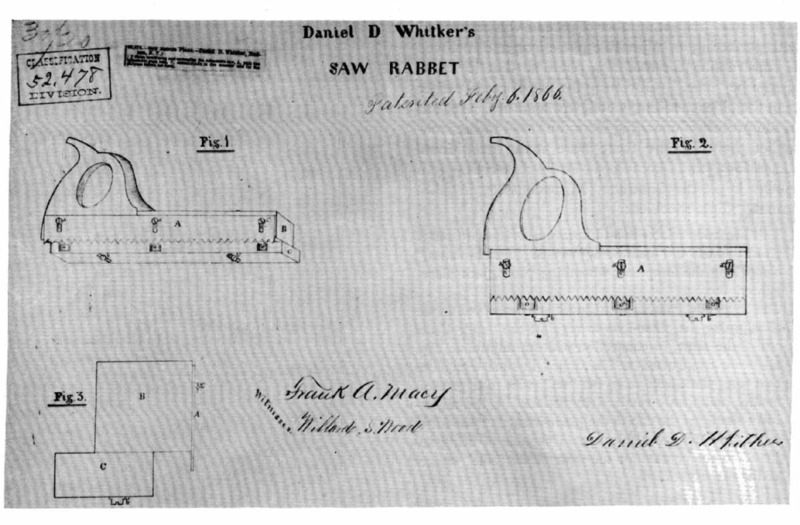 the improved manufacture of [the] carpenter’s bench plane or jointer as made with its handle, its wooden stock to which said handle is affixed, and a separate metallic cutter holder, and cutter clamping devices arranged together substantially as specified. I denominate my improvement the “universal smoothing plane,” because it belongs to that variety of planes in which the face is made changeable, so that it may be conveniently adapted to the planing of curved as well as straight surfaces. By the use of my improvement surfaces that are convex, concave, or straight may be easily worked, the face of the tool being readily changed from one form to another to suit the surface to which it is to be applied. The announced object of Theodore Duval’s improved grooving plane (pat. 97,177) was “to produce in one tool all that is required to form grooves of several different widths.” None was more appealing than Daniel D. Whitker’s saw-rabbet plane (pat. 52,478) which combined “an adjustable saw with an adjustable fence or gage, both being attached to a stock with handle similar to a plane, forming together a tool combining the properties of the joiner’s plow and fillister” (fig. 61). Nor was Whitker’s idea simply a drawing-board exercise. It was produced commercially and was well advertised, as seen in the circular reproduced in figure 62. 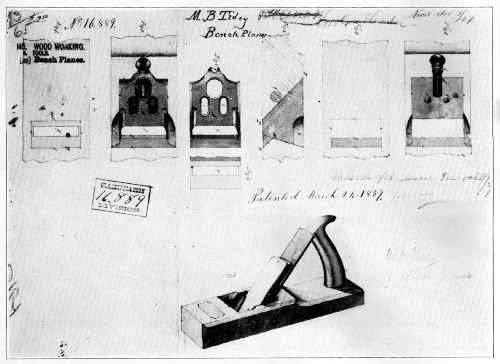 In sum, these ideas produced a major break with the traditional shape of the bench plane. William Foster in 1843 (pat. 3,355), Birdsill Holly in 1852 (pat. 9,094), and W.S. Loughborough in 1859 (pat. 23,928) are particularly good examples of the radical departure from the wooden block. And, in the period after the Civil War, C.G. Miller (discussed on p. 213 and in fig. 63), B.A. Blandin (fig. 64), and Russell Phillips (pat. 106,868) patented multipurpose metallic bench planes of excellent design. It should be pointed out that the patentees mentioned above represent only a few of the great number that tried to improve the plane. Only the trend of change is suggested by the descriptions and illustrations presented here. The cumulative effect awaited a showcase, and the planemakers found it at the Centennial Exhibition of 1876 held in Philadelphia. The planes manufactured in Great Britain and in other countries fifty years ago were formed of best beech-wood; the plane irons were of steel and iron welded together; the jointer plane, about 21 inches long, was a bulky tool; the jack and hand planes were of the same materials. Very little change has been made upon the plane in Great Britain, unless in the superior workmanship and higher quality of the plane iron. 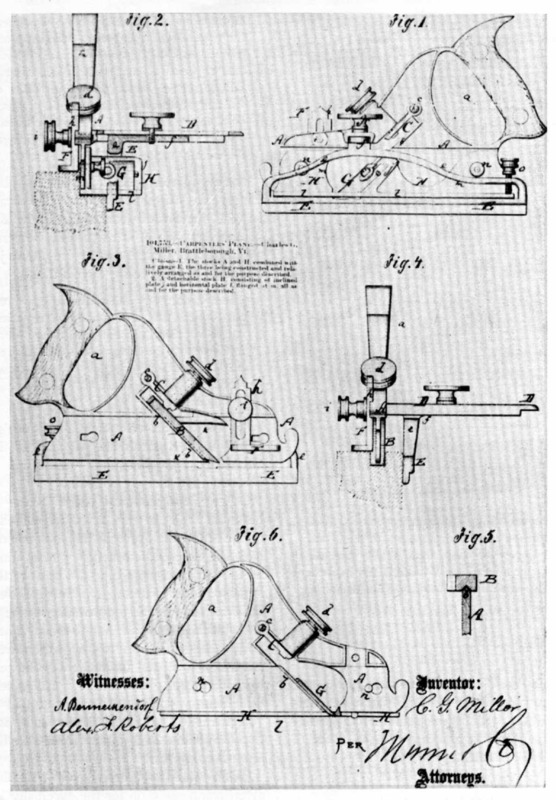 constructed with a skeleton iron body, having a curved wooden handle; the plane iron is of the finest cast-steel; the cover is fitted with an ingenious trigger at the top, which, with a screw below the iron, admits of the plane iron being removed for sharpening and setting without the aid of the hammer, and with the greatest ease. The extensive varieties of plane iron in use are fitted for every requirement; a very ingenious arrangement is applied to the tools for planing the insides of circles or other curved works, such as stair-rails, etc. The sole of the plane is formed of a plate of tempered steel about the thickness of a handsaw, according to the length required, and this plate is adapted to the curve, and is securely fixed at each end. With this tool the work is not only done better but in less time than formerly. In some exhibits the face of the plane was made of beech or of other hard wood, secured by screws to the stock, and the tool becomes a hybrid, all other parts remaining the same as in the iron plane. These tools meet with universal approbation from the best Mechanics. For beauty of style and finish they are unequalled, and the great convenience in operating renders them the cheapest Planes in use; they are SELF-ADJUSTING in every respect; and each part being made INTERCHANGEABLE, can be replaced at a trifling expense. 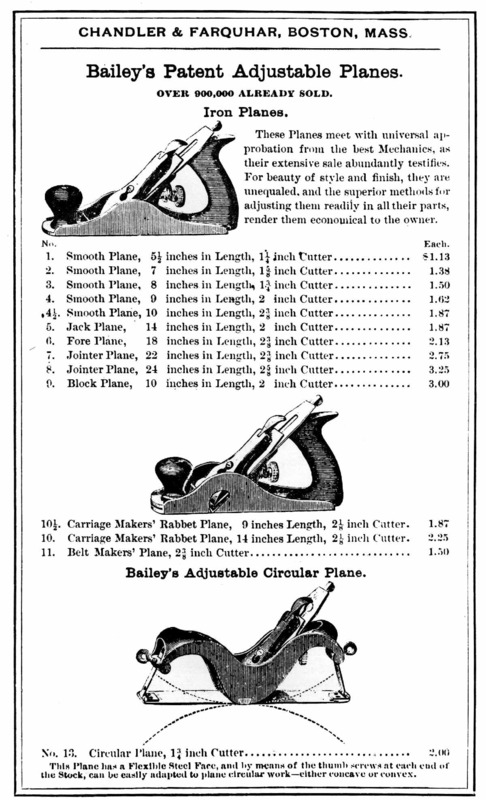 By 1900 an advertisement for Bailey’s planes published in the catalogue of another Boston firm, Chandler and Farquhar, indicated that “over 900,000” had already been sold. Collins and Company of New York City had been given commendation for the excellence of their axes; through the end of the century, Collins’ brand felling axes, broad axes, and adzes were standard items, as witness Hammacher, Schlemmer and Company’s catalogue of 1896. 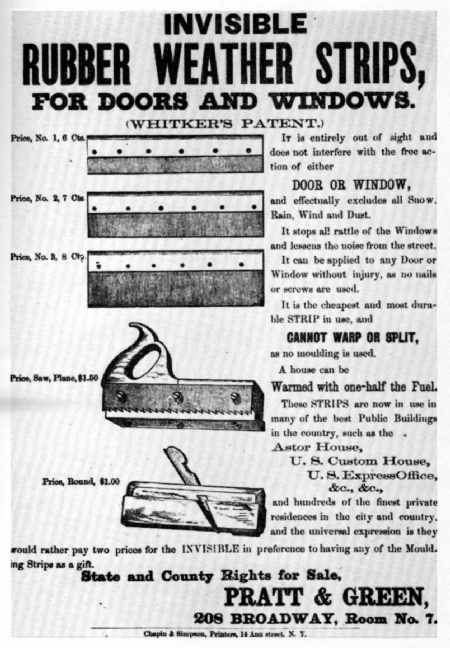 Disston saws were a byword, and the impact of their exhibit at Philadelphia was still strong, as judged from Baldwin, Robbins’ catalogue of 1894. Highly recommended was the Disston no. 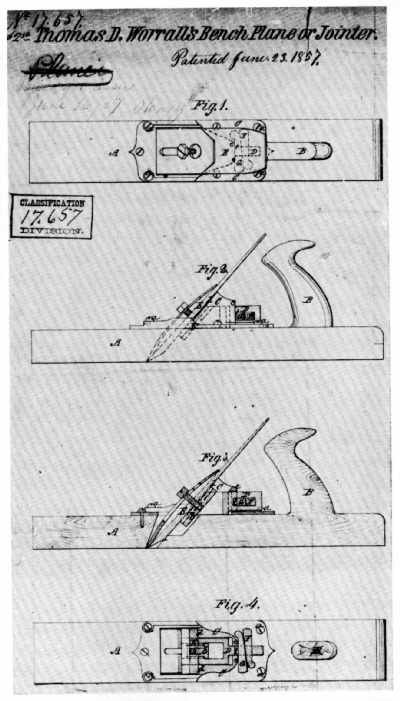 76, the “Centennial” handsaw with its “skew back” and “apple handle.” Jennings’ patented auger bits were likewise standard fare in nearly every tool catalogue. So were bench planes manufactured by companies that had been cited at Philadelphia for the excellence of their product; namely, The Metallic Plane Company, Auburn, New York; The Middletown Tool Company, Middletown, Connecticut; Bailey, Leonard, and Company, Hartford; and The Sandusky Tool Company, Sandusky, Ohio. 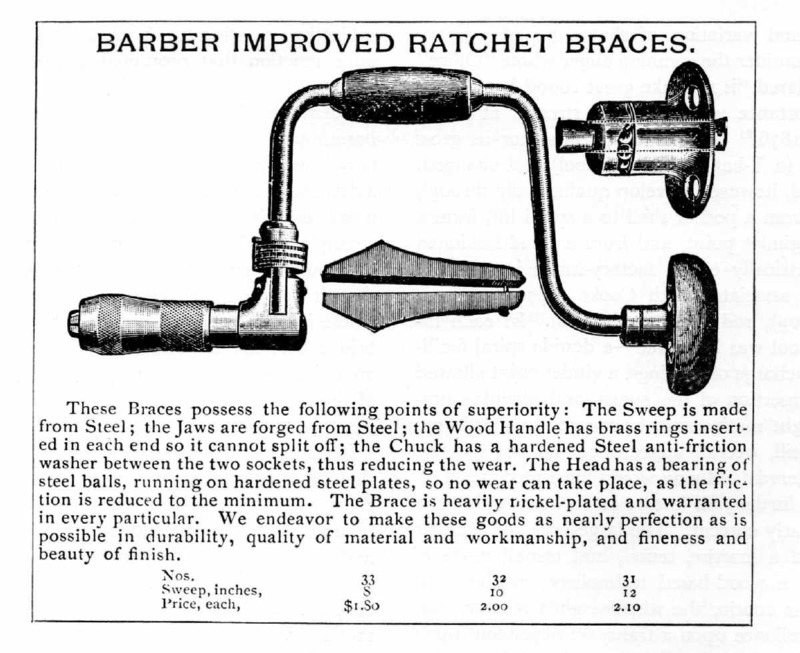 These Braces possess the following points of superiority: The Sweep is made from Steel; the Jaws are forged from Steel; the Wood Handle has brass rings inserted in each end so it cannot split off; the Chuck has a hardened Steel antifriction washer between the two sockets, thus reducing the wear. The Head has a bearing of steel balls, running on hard steel plates, so no wear can take place, as the friction is reduced to the minimum. 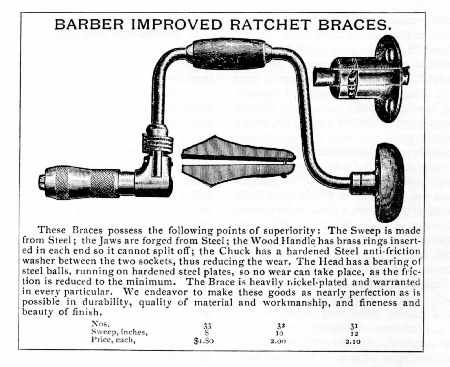 The Brace is heavily nickel-plated and warranted in every particular. We endeavor to make these goods as nearly perfection as is possible in durability, quality of material and workmanship, and fineness and beauty of finish. If heeded, the result would be an edge tool that assured its owner “ease and delight.” Throughout the period considered here, the most praiseworthy remarks made about edge tools were variations of either “unsurpassed in quality, finish, and beauty of style” or, more simply, commendation for “excellent design and superior workmanship.” The hand tool thus provoked the same value words in the 19th as in the 17th century. The aesthetics of industrial art, whether propounded by Moxon or by an official at the Philadelphia Centennial, proved the standard measure by which quality could be judged. Today these values are particularly valid when applied to a class of artifacts that changed slowly and have as their prime characteristics anonymity of maker and date. With such objects the origin, transition, and variation of shape are of primary interest. Consider the common auger whose “Office” Moxon declared “is to make great round holes” and whose importance was so clearly stressed at Philadelphia in 1876. Neither its purpose nor its gross appearance (a T-handled boring tool) had changed. The tool did, however, develop qualitatively through 200 years, from a pod or shell to a spiral bit, from a blunt to a gimlet point, and from a hand-fashioned to a geometrically exact, factory-made implement: innovations associated with Cooke (1770), L’Hommedieu (1809), and Jennings (1850’s). In each instance the tool was improved—a double spiral facilitated the discharge of shavings, a gimlet point allowed the direct insertion of the auger, and machine precision brought mathematical accuracy to the degree of twist. Still, overall appearance did not change. 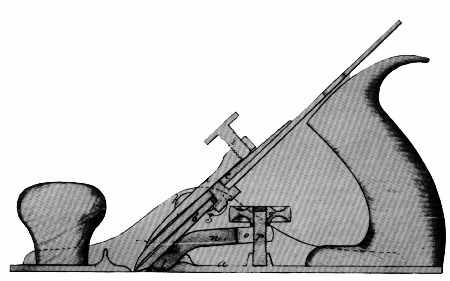 At the Centennial, Moxon would have recognized an auger, and, further, his lecture on its uses would have been singularly current. The large-bore spiral auger still denoted a mortise, tenon, and trenail mode of building in a wood-based technology; at the same time its near cousin, the wheelwright’s reamer, suggested the reliance upon a transport dependent upon wooden hubs. The auger in its perfected form—fine steel, perfectly machined, and highly finished—contrasted with an auger of earlier vintage will clearly show the advance from forge to factory, but will indicate little new in its method of use or its intended purpose. Persons neither skilled in the use of tools nor interested in technical history will find that there is another response to the common auger, as there was to the upholsterer’s hammer, the 18th-century brace, or the saw with the custom-fitted grip. This is a subjective reaction to a pleasing form. It is the same reaction that prompted artists to use tools as vehicles to help convey lessons in perspective, a frequent practice in 19th-century art manuals. The harmony of related parts—the balance of shaft and handle or the geometry of the twist—makes the auger a decorative object. This is not to say that the ancient woodworker’s tool is not a document attesting a society’s technical proficiency—ingenuity, craftsmanship, and productivity. It is only to suggest again that it is something more; a survival of the past whose intrinsic qualities permit it to stand alone as a bridge between the craftsman’s hand and his work; an object of considerable appeal in which integrity of line and form is not dimmed by the skill of the user nor by the quality of the object produced by it. In America, this integrity of design is derived from three centuries of experience: one of heterogeneous character, the mid-17th to the mid-18th; one of predominately English influence, from 1750 to 1850; and one that saw the perfection of basic tools, by native innovators, between 1850 and the early 20th century. In the two earlier periods, the woodworking tool and the products it finished had a natural affinity owing largely to the harmony of line that both the tool and finished product shared. The later period, however, presents a striking contrast. Hand-tool design, with few exceptions, continued vigorous and functional amidst the confusion of an eclectic architecture, a flurry of rival styles, the horrors of the jigsaw, and the excesses of Victorian taste. In conclusion, it would seem that whether seeking some continuous thread in the evolution of a national style, or whether appraising American contributions to technology, such a search must rest, at least in part, upon the character and quality of the hand tools the society has made and used, because they offer a continuity largely unknown to other classes of material survivals.